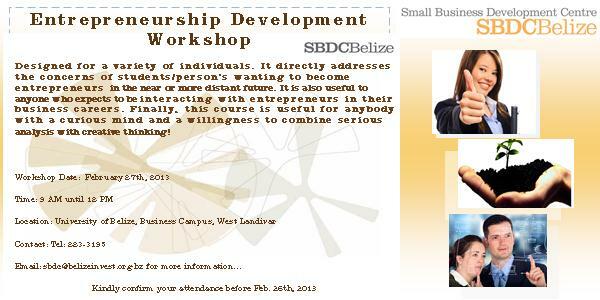 SBDCBelize, BELTRAIDE and Mr. Jose Herrera, Lecturer for Small Business Management at the University of Belize is presenting the Entrepreneurship Development Workshop which will be held on February 27th, 2013 on campus!!! Please keep me abreast of your upcoming events. I am interested in your programs and specifically setting up and organizing a Belize corporation to own and operate an American Franchise opportunity in Belize. We will definitely keep you posted Mr. Wallace.. We encourage you to continue follow our blog,and visit our website: belizeinvest.org.bz.. We have also added you to our mailing list, to ensure that you are kept abreast with our events.